Crimson Duo made their New York City debut at the 2012 American Harp Society 50th Anniversary National Conference. The duo has performed concerts in Hong Kong, New York City, New Orleans, Atlanta, Colorado, and throughout the Dallas-Fort Worth area. Their recent feature at the World Harp Congress in Hong Kong (2017) led to collaborations with British composer, Paul Patterson. 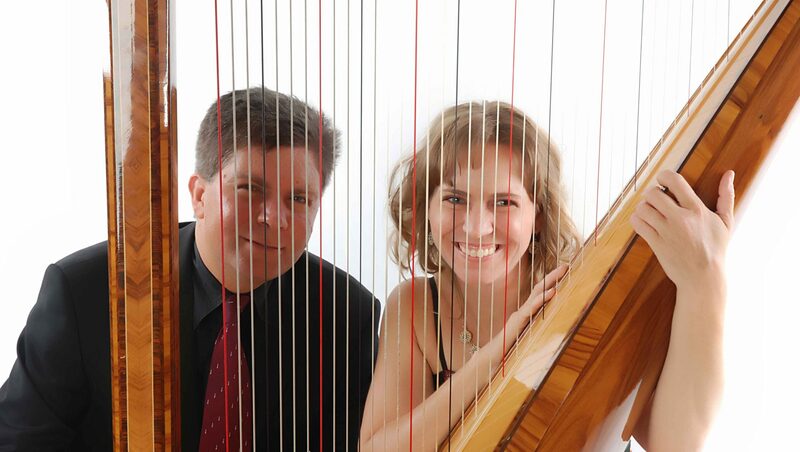 In 2016, the duo premiered a composition by Patricio Da Silva, made possible by a grant from the American Harp Society, Inc. Their inaugural compact disc single, Crimson, features works by Piazzolla and Saint-Saens. Their second compact disc will be available in 2019, featuring works commissioned by and written for this innovative duo. Currently, Jaymee and Matt are collaborating with Libby Larsen on a new work for harp and violin, called In Praise of Shadow and are collaborating with photographer Luke Mislinski to fuse visual and aural art forms in their concerts To see more of his work and the images associated with Crimson’s performances, visit his webpage at: www.lukemphoto.com (click on “featured”) and the blog for his upcoming film at: www.karmadocumentary.com. Jaymee Haefner is the Assistant Professor of Harp for the University of North Texas College of Music. Dr. Haefner serves as the World Harp Congress Treasurer, frequently writes for the Harp Column, and published The Legend of Henriette Renié and One Stone to the Building: Henriette Renie’s Life Through Her Works forHarp. She also serves on the board of the American Harp Society Foundation and is on the editorial board for the American Harp Journal. She holds Bachelor of Music and Master of Music degrees from the University of Arizona Fred Fox School of Music, and the Doctor of Music degree from Indiana University Jacobs School of Music. Matthew Milewski is currently performing with the Dallas Symphony Orchestra. Before moving to Texas in 2010 when he joined the Fort Worth Symphony Orchestra, Mr. Milewski had been a full-time member of the Louisville, Grand Rapids, and Charleston Symphonies as well as performed and continues to perform as an extra musician with the Houston, New Orleans, St. Louis, Kansas City, Cincinnati, Indianapolis, and Nashville Symphonies. A dynamic performer, he studied with Julia Bushkova at the Interlochen Arts Academy and attended the Indiana University Jacobs School of Music, earning a performance diploma studying with Yuval Yaron. Mr. Milewski holds the Master of Music degree from the Manhattan School of Music.